Step on up, Occidental Petroleum (NYS: OXY) . Now we know how much cash Occidental Petroleum is really pulling in each year. Next question: What is it doing with that cash? There are two ways a company can use free cash flow to directly reward shareholders: dividends and share repurchases. Cash not returned to shareholders can be stashed in the bank, used to invest in other companies and assets, or used to pay off debt. Not bad. 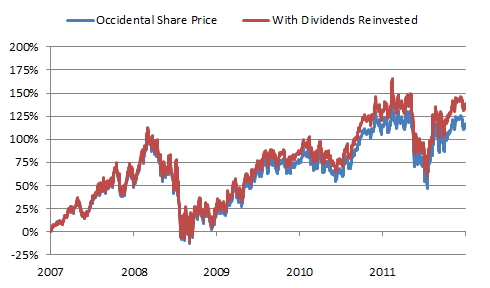 Almost all of Occidental's buybacks in the past five years came in 2007 and 2008, and shares have since increased substantially. 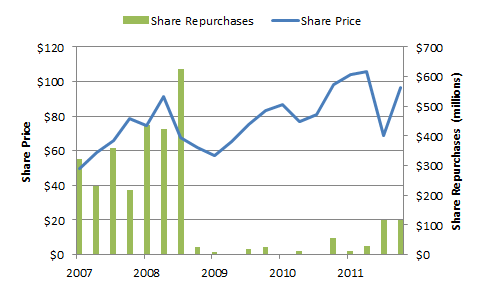 These repurchases were probably a great deal for shareholders. Shares returned 130% over the past five years, which drops to 110% without dividends -- a nice boost to top off already high performance. To gauge how well a company is doing, keep an eye on the cash. How much a company earns is not as important as how much cash is actually coming in the door, and how much cash is coming in the door isn't as important as what management actually does with that cash. Remember, you, the shareholder, own the company. Are you happy with the way management has used Occidental Petroleum's cash? Sound off in the comment section below. Add Occidental Petroleum to My Watchlist. At the time this article was published Fool contributorMorgan Houseldoesn't own shares in any of the companies mentioned in this article. Follow him on Twitter, where he goes by@TMFHousel.Try any of our Foolish newsletter services free for 30 days. We Fools don't all hold the same opinions, but we all believe that considering a diverse range of insights makes us better investors. The Motley Fool has a disclosure policy.